The next chapter — or should we say heist? — from the Ocean’s franchise will drop in June with Sandra Bullock as Danny Ocean’s ex-con sister Debbie. She’ll lead a team of thieves (played by Cate Blanchett, Mindy Kaling, and Sarah Paulson, among others) as they crash New York’s Met Gala to swipe a priceless necklace off a celebrity neck. We asked Bullock to take us behind-the-scenes of one of the most anticipated sequels in the long and checkered history of sequels. ENTERTAINMENT WEEKLY: You play Debbie Ocean, Danny’s sister. Can you share a little of your backstory? SANDRA BULLOCK: Well not too much. I mean, I feel like we’re a Marvel film and we’re trying to at least let there be some surprises when the film comes out. Yes, I am Danny Ocean’s sister. I’ve been incarcerated for about five years and you find out why during the course of the film. I mean, that’s sort of a tiny subplot. But that’s, you know, but I’m definitely his sister and we definitely come from the same family and we’re both very good at what we do in our own special way. So you can only imagine that once I get out, that’s when the heist ensues. Do the gals in your gang fill the archetypes that we’ve seen from the Oceans franchise? Everyone has their specialty, yes. What’s fun is that it’s not their whole life. And they haven’t been able to do what they’re brilliant at because the industry, if you can call it the industry, the industry of crime hasn’t really allowed them to excel and execute what they’re good at. So you’ll find one who’s a stay-at-home mom with two children who sells things on the QVC. And here comes Debbie Ocean who enlists their help of them, but not because she only wants females. It’s really fun. Imagine all eight of us crammed into a makeup trailer in the morning. You think that it would be disastrous but it was heaven, all of us just sharing information, all of us doing three jobs with families, our other jobs, the juggling. And then we get to shoot this movie together. What was the dynamic like on the set with all those female stars? It was so great. I would say, isn’t that funny how with the guys, I don’t remember ever hearing anything about potential discord. But you so get it with women. If there’s ever more than two women in the film there’s rumblings of, “oh, they’re having cat fights.” There was nothing, because I think because of the unique situation of this and because we all are trying to achieve the same thing, we bonded pretty quickly out of necessity and just because we like each other. We all were able to fit in this trailer while we were getting fluffed and folded, and share information. I don’t know how to do this, where did you do this? Oh my God, my son needs a uniform. Oh my God, I have this great website. What do you do in this work situation? How are you internet managing? For the first time in my life I felt there was a sharing of all this information. We all looked at each other and went, why didn’t we know these things before? I realized as women we have been isolated for a while. I don’t even want to touch on that other subject, but women are now taking care of each other. We all were like, okay, let’s just take care of each other for these six months and relish this opportunity we’re being given. But we don’t want it to be just for women. This is not a man-hating. We love the men. There’s men in this movie. We love them. But this one heist needs women. When it was announced there would be an all-female cast of Ghostbusters, those actresses were put through hell. Has it been the same for the cast of Oceans 8? They did put them through hell. And I’m still trying to figure out why. Forget what the final product was! There were four or five of the most talented comediennes in that film. Everyone should’ve just taken a breath and said, “let’s see what happens.” It doesn’t take just five people to make a movie. It’s pretty much like around 300. So I keep reminding everybody, if you hate my film remember there’s another 299 people all around me. We’re not a reboot. We’re just a this is what’s happening in 2017. It’s not even a passing of the torch. It’s a parallel story of another family member that was raised in the same family Danny Ocean was and what happens when Debbie steps out of jail with all of these amazing, powerful women. So you have heard some negative comments? We got some but boy, I mean, I’ll tell you, we’ve got some feisty women that will fight right back. It’s like, let’s just take a breath and let’s just see if we come up with something fun. There should be a moratorium. There should be a rule, you’re not allowed to say anything nasty until after it comes out. Obviously that’s never going to happen. Is this the start of something wonderful, like an Ocean’s 9 with Emma Stone or something? How great would that be? I don’t know. I think the mindset was let’s just see if we can make this work, and let’s see if we can get the greatest actors and we did. Let’s see if we can take the original and then make our own version, sort of pay homage to the Ocean series.I don’t like sequels. Well, you know what, I don’t like the sequels that I’ve done. I mean, I should just correct that. My sequels were done in the time where it was sort of, oh, the first one worked, let’s just slap something together for the second one. And that’s not the way things are anymore. Things have changed as people realize we need to step up our game, have something as good if not better. 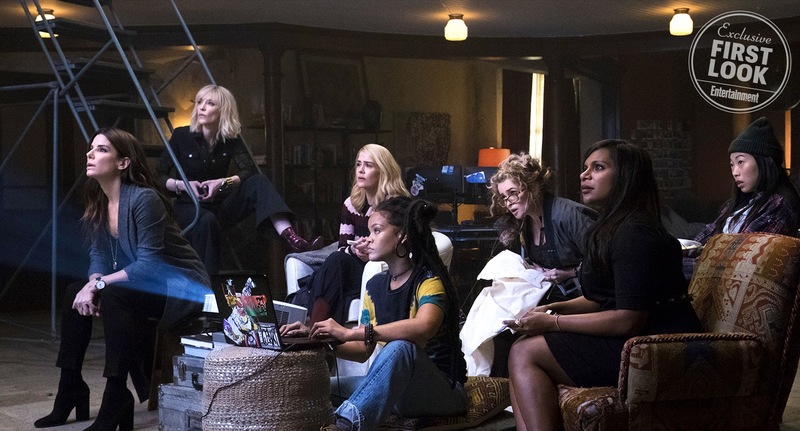 If something strikes a chord, an Ocean’s 9 would be ideal. Ocean’s 8 hits theaters on June 8.